Colts: Ted Hendricks, John Mackey, Johnny Unitas. Cowboys: Tom Landry (coach), Herb Adderley, Mike Ditka, Bob Hayes, Bob Lilly, Mel Renfro, Roger Staubach, Rayfield Wright. Super Bowl V was an American football game between the American Football Conference (AFC) champion Baltimore Colts and the National Football Conference (NFC) champion Dallas Cowboys to decide the National Football League (NFL) champion for the 1970 season. The Colts defeated the Cowboys by the score of 16–13. The game was played on January 17, 1971, at the Orange Bowl in Miami, Florida, the first Super Bowl game played on artificial turf. This was the first Super Bowl played after the completion of the AFL-NFL Merger. As per the merger agreement, all 26 AFL and NFL teams were divided into 2 conferences with 13 teams in each of them. Along with the Colts, the Cleveland Browns and the Pittsburgh Steelers agreed to join the 10 AFL teams to form the AFC. The remaining 13 NFL teams formed the NFC. This explains why the Colts represented the NFL in Super Bowl III, but not the NFC for Super Bowl V. Baltimore advanced to Super Bowl V after posting an 11–2–1 regular season record. Meanwhile, the Cowboys were making their first Super Bowl appearance after posting a 10–4 regular season record. The game is sometimes called the "Blunder Bowl" or the "Stupor Bowl" because it was filled with poor play, penalties, turnovers, and officiating miscues. The two teams committed a Super Bowl record 11 combined turnovers in the game, and the Colts' 7 turnovers are currently the most ever committed by a winning team in a Super Bowl. Dallas also set a Super Bowl record with 10 penalties, costing them 133 yards. It was finally settled with five seconds left when Colts rookie kicker Jim O'Brien kicked a 32-yard field goal. In order to win the game, Baltimore had to overcome a 13–6 deficit at the half, losing their starting quarterback in the second quarter. It is the only Super Bowl in which the Most Valuable Player Award was given to a member of the losing team: Cowboys linebacker Chuck Howley, who intercepted two passes (sacks and tackles were not yet recorded). Howley, the first non-quarterback to win the MVP award, refused to accept it because it was meaningless to him after his team lost. In a similar vein, Colts defensive end Bubba Smith would later refuse to wear his Super Bowl V ring because of the "sloppy" play. The NFL awarded Super Bowl V to Miami on March 17, 1970 at the owners meeting held in Honolulu. In addition, Baltimore had 3 solid weapons in the passing game: wide receivers Eddie Hinton and Roy Jefferson, and future Hall of Fame tight end John Mackey combined for 119 receptions, 1,917 yards, and 15 touchdowns. In the backfield, running back Norm Bulaich was the team's top rusher with 426 yards and 3 touchdowns, while also catching 11 passes for another 123 yards. The Colts' main strength was their defense. Pro Bowl defensive tackle Bubba Smith anchored the line. Behind him, the Colts had 2 outstanding linebackers: Pro Bowler Mike Curtis, who recorded 5 interceptions, and Ted Hendricks. In the secondary, Pro Bowl safety Jerry Logan recorded 6 interceptions for 92 return yards and 2 touchdowns, while safety Rick Volk had 4 interceptions for 61 return yards. Don Klosterman, formerly with San Diego, Kansas City and Houston in the AFL, became the Colts' General Manager in 1970. Future Colts GM Ernie Accorsi was the public relations director. Baltimore finished the regular season winning the AFC East with an 11–2–1 record, also the best record in the AFC. Only the Minnesota Vikings had a better record among all NFL teams, going 12-2. The Cowboys had to overcome many obstacles during the regular season. Running back Calvin Hill, the team's second leading rusher with 577 yards and 4 touchdowns, was lost for the year after suffering a leg injury late in the regular season. And wide receiver Bob Hayes was benched by head coach Tom Landry for poor performances on several occasions. Most significantly, the Cowboys had a quarterback controversy between Craig Morton and Roger Staubach. Morton and Staubach alternated as the starting quarterback during the regular season. Landry eventually settled on Morton for most of the second half of the season, because he felt less confident that Staubach would follow his game plan (Landry called all of Morton's plays). Also, Morton had done extremely well in the regular season, throwing for 1,819 yards and 15 touchdowns, with only 7 interceptions, earning him a passer rating of 89.8. In contrast, Staubach, although a noted scrambler and able to salvage broken plays effectively, threw for 542 yards, and only 2 touchdowns compared to 8 interceptions, giving him a 42.9 rating. Hayes was the main deep threat on the team, catching 34 passes for 889 yards (a 26.1 yards per catch average) and 10 touchdowns, while also rushing 4 times for 34 yards and another touchdown, and adding another 116 yards returning punts. On the other side of the field, wide receiver Lance Rentzel (who would be deactivated for the last few weeks of the season and postseason following an indecent exposure charge; being replaced in the starting lineup by Reggie Rucker) recorded 28 receptions for 556 yards and 5 touchdowns. However, the main strength on the Cowboys offense was their running game. Rookie running back Duane Thomas rushed 151 times for 803 yards (a 5.1 yards per carry average) and 5 touchdowns, while adding another 416 yards returning kickoffs. Fullback Walt Garrison, who replaced the injured Hill, provided Thomas with excellent blocking and rushed for 507 yards and 3 touchdowns himself. Garrison was also a good receiver out of the backfield, catching 21 passes for 205 yards and 2 touchdowns. Up front, Pro Bowl guard John Niland and Rayfield Wright anchored the offensive line. Like the Colts, the Cowboys main strength was their defense. Nicknamed the "Doomsday Defense", they allowed just 1 touchdown in their last 6 games prior to the Super Bowl. Their line was anchored by future Hall of Fame defensive tackle Bob Lilly. Behind him, linebackers Lee Roy Jordan, Dave Edwards and Chuck Howley excelled at stopping the run and pass coverage. The Cowboys also had an outstanding secondary, led by Mel Renfro and Herb Adderley, who combined for 7 interceptions. Safety Charlie Waters led the team with 5 interceptions, while safety Cliff Harris recorded 2. Dallas finished the regular season winning the NFC East with a 10–4 record, winning their final five regular season games to overcome the St. Louis Cardinals (who lost their final three games and fell to third place in the final standings) and New York Giants (who lost their finale 31–3 to the Los Angeles Rams; a Giants victory would have given New York the NFC East title based upon a better division record and forced a coin toss between the Cowboys and Detroit Lions for the wild card playoff spot). In the playoffs, Dallas defeated the Detroit Lions in sunny weather at the Cotton Bowl, 5–0, with a field goal and a safety. Then the Cowboys overcame the San Francisco 49ers in the NFC championship game, 17–10, aided by Thomas' 143 rushing yards, along with interceptions by Renfro and Jordan late in the third quarter that were both converted into touchdowns. Meanwhile, the Colts advanced to the Super Bowl by beating the Cincinnati Bengals, 17–0, and the Oakland Raiders, 27–17, in the playoffs. For the Colts, Super Bowl V represented a chance to redeem themselves for their humiliating loss to the New York Jets in Super Bowl III. Volk commented, "Going to the game a second time took away some of the awe. I think we were able to focus better. There was no way we were going to let ourselves get beat again." Meanwhile, the game was a chance for the Cowboys to lose their nickname of "next year's champions" and their reputation of "not being able to win the big games". In the past 5 seasons, Dallas had won more games, 52 out of 68, than any other professional football team, but they had never won any league title. The Cowboys had chances to go to the first two Super Bowls, but narrowly lost to the Green Bay Packers in both the 1966 and 1967 NFL Championship games. In the 1966 title game, the Cowboys lost because they failed to score a touchdown on 4 attempts starting from the Packers 2-yard line on the game's final drive. Then in the 1967 title game (the "Ice Bowl"), the Cowboys lost because they allowed the Packers to score a touchdown with 16 seconds left in the game. As the designated home team, Dallas was forced to wear its blue jerseys for the Super Bowl under rules in place at the time, which did not allow the home team its choice of jersey color, unlike the regular season and playoff games leading up to the Super Bowl. Dallas had not worn its blue jerseys at home since 1964, as Cowboys general manager Tex Schramm opted to have the team wear white at home in order to present fans with a consistent look. The Cowboys wore their blue jerseys twice during the 1970 season, losing 20–7 at St. Louis in week four and winning 6–2 at Cleveland in week 13. The designated home team was first allowed its choice of jersey color for Super Bowl XIII, allowing the Cowboys to wear white vs. the Pittsburgh Steelers. The game was broadcast in the United States by NBC with play-by-play announcer Curt Gowdy and color commentator Kyle Rote. 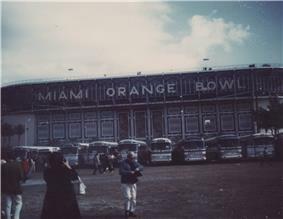 Although the Orange Bowl was sold out for the event, unconditional blackout rules in the NFL prohibited the live telecast from being shown in the Miami area. The blackout was challenged in Miami-Dade District Court by attorney Ellis Rubin, and although the judge denied Rubin's request since he felt he did not have the power to overrule the NFL, he agreed with Rubin's argument that the blackout rule was unnecessary for the Super Bowl. Super Bowl V is the last Super Bowl to have had the majority of its telecast wiped. The bands from Southern University and Southeast Missouri State College performed before the game, while trumpeter Tommy Loy played the national anthem. Loy also played the anthem before every Cowboys' home game from the mid-1960s until the late-1980s. The Southeast Missouri State Indians Band was featured during the halftime show along with singer Anita Bryant. The first 3 possessions of the game ended with punts after the respective teams went three-and-out on each one. Then on the first play of the Colts' second drive, Dallas linebacker Chuck Howley intercepted a pass from Johnny Unitas and returned it 22 yards to Baltimore's 46-yard line before being tackled by Unitas himself. The Cowboys could not take advantage of the turnover, however, as a result of a holding penalty on the drive and had to punt. Colts punt returner Ron Gardin fumbled the punt and Cowboys safety Cliff Harris recovered the ball at the Baltimore 9-yard line. Despite their great starting field position, Dallas was unable to score a touchdown and thus had to settle for kicker Mike Clark's 14-yard field goal to give them a 3 – 0 lead. Dallas forced the Colts to punt on their next possession, and, several plays later, quarterback Craig Morton completed a 47-yard pass to Bob Hayes at the Colts 12-yard line, with a roughing the passer penalty adding 6 yards (half the distance to the goal). Dallas, despite being first and goal at the 6 yard line, was still unable to score a touchdown. On first down, linebacker Ted Hendricks deflected Morton's pass, and then running back Duane Thomas was tackled for a 1-yard loss on the next play. Then on third down, Morton committed a 15-yard intentional grounding penalty, pushing the Cowboys back to the 22-yard line and forcing them to settle for Clark's 30-yard field goal, giving them a 6–0 lead. On the ensuing drive, the Colts got a break. Baltimore defensive back Jim Duncan returned the kickoff 22 yards to their 25-yard line. Then after throwing 2 incompletions, Unitas threw a pass to Eddie Hinton that was both high and behind the receiver. The ball bounced off Hinton's hands, was tipped by Dallas defensive back Mel Renfro, and finally ended up in the arms of tight end John Mackey, who took the ball 75 yards for a touchdown, tying the score 6 – 6 after Jim O'Brien's extra point attempt was blocked. O'Brien later said that he was "awfully nervous" and hesitated a second too long before kicking it. In the second quarter, Dallas took a 13 – 6 lead when Morton threw a 7-yard touchdown pass to Thomas at the end of a drive that was set up after Unitas lost a fumble while being tackled by Cowboys linebacker Lee Roy Jordan. The next time the Colts had the ball, Unitas was hit as he threw a pass, resulting in an interception by Renfro. On the play, Unitas was knocked out of the game with a rib injury, and was replaced by Earl Morrall, who was widely blamed for the Colts loss in Super Bowl III. The Cowboys were unable to get any points off the turnover and had to punt. After the punt, Morrall completed two passes for 47 yards, with a personal foul on Jordan adding another 7 yards and giving them a first down on the Cowboys 2-yard line with less than two minutes left in the half. But Colts running back Norm Bulaich failed to gain any yards with three rushing attempts, and on fourth down, Morrall threw an incomplete pass, turning the ball over on downs. Duncan fumbled the opening kickoff of the second half to Dallas, and the Cowboys moved the ball down to the Colts' 1-yard line. But then Thomas returned the favor when Mike Curtis knocked the ball loose before the goal line. Duncan was awarded the recovery and the Colts took over on a touchback – a controversial call because when the resulting pile-up was sorted out, Dallas center Dave Manders was holding the ball. The Colts then drove to Dallas' 44-yard line, but came up empty when O'Brien's 52-yard field goal attempt fell short of the goal posts. However, instead of attempting to return the ball, Renfro let it bounce inside his own 1-yard line where it was downed by center Tom Goode (NFL rules prior to 1974 allowed a field goal that fell short of the goal posts to be downed just like a punt). "I thought it would carry into the end zone", he explained after the game. The Colts defense then forced Dallas to punt after 3 plays, and would have gotten the ball inside Dallas territory following Ron Widby's punt, but Colts rookie running back Jack Maitland committed a 15-yard clipping penalty during the punt return, pushing his team back to their own 39 for their ensuing drive. Two plays later, Morrall completed a 47-yard pass to running back Tom Nowatzke at the Cowboys 15-yard line. Baltimore gained 4 yards on their next 2 plays, but on the first play of the fourth quarter, Morrall's pass was intercepted by Howley in the end zone. After forcing the Cowboys to punt, Baltimore got the ball back on their own 18-yard line. On first down, Morrall's pass was incomplete. Then on the next play, Morrall fumbled the snap. Fortunately for the Colts, he managed to recover the fumble and throw the ball away, preventing a loss of yards or a turnover. On third down, Morrall threw his third consecutive incompletion, which would have forced Baltimore to punt from deep in their own territory, but Renfro was called for a 13-yard pass interference penalty while trying to cover Hinton, giving the Colts a first down. Aided by a 23-yard completion from Morrall to receiver Roy Jefferson, the Colts drove to Dallas' 30-yard line and attempted to fool the Cowboys with a flea-flicker play. Running back Sam Havrilak took a handoff from Morrall and was supposed to throw it back to Morrall, but a charging Jethro Pugh disrupted the pattern. Havrilak (who had been a quarterback in college) instead threw a pass intended for Mackey. Hinton cut in front of Mackey to make the catch and then took off for the end zone, but he lost a fumble at the 10-yard line while being tackled by defensive back Cornell Green. After several players from both teams tried to recover it, the ball rolled through and out of the end zone for a touchback, giving the Cowboys the ball at their 20-yard line. Three plays after the turnover, Morton threw a pass that was intercepted by safety Rick Volk and returned 30 yards to the Cowboys 3-yard line (Morrall later referred to play as the play of the game). Two plays later, Nowatzke scored on a 2-yard touchdown run and O'Brien's extra point was good to tie the game, 13 – 13. (O'Brien says he was much calmer and more confident on this extra point than on the first one, which was blocked.) Dallas was forced to punt on their ensuing drive, and Widby managed to pin the Colts deep in their own territory with a 40-yard punt that was downed on Baltimore's 5-yard line. Dallas' defense forced Baltimore to punt after 3 plays, and got the ball back with great starting field position after receiving David Lee's 38-yard punt at the Colts 48-yard line with less than 2 minutes left in the game. On the first play of the drive, Thomas was tackled for a 1-yard loss by Colts defensive tackle Bubba Smith. On the next play, Dallas committed a 15-yard holding penalty on the 42-yard line, which was a spot foul, pushing the team all the way back to their own 27-yard line (the NFL did not reduce the penalty for offensive holding to 10 yards until 1974). Then on second down and 35 to go, Morton threw a pass that went through the hands of running back Dan Reeves and into the arms of linebacker Mike Curtis, who returned the ball 13 yards to the Cowboys 28-yard line. Two plays later, O'Brien kicked the go ahead 32-yard field goal, giving Baltimore a 16–13 lead with 5 seconds left in the game. O'Brien says he was "on automatic" and was so calm and concentrating so hard that he didn't hear anything and saw only the ball. In an enduring image from Super Bowl V, after O'Brien's game-winning field goal Bob Lilly took off his helmet and hurled it through the air in disgust. The Cowboys got the ball back on their 40-yard line with a few seconds remaining after O'Brien's ensuing squib kick, but Morton's pass to Garrison was intercepted by Logan at the Baltimore 29-yard line, and time expired. Morrall was the top passer of the game, with 7 out of 15 completions for 147 yards, with 1 interception. Before being knocked out of the game, Unitas completed 3 out of 9 passes for 88 yards and a touchdown, with 2 interceptions. Morton completed more passes than Morrall and Unitas combined (12), but finished the game with 118 fewer passing yards (127), and was intercepted 3 times (all in the fourth quarter). Mackey was the top receiver of the game with 2 receptions for 80 yards and a touchdown. Nowatzke was the Colts' leading rusher with 33 yards and a touchdown, while also catching a pass for 47 yards. Dallas running back Walt Garrison was the leading rusher of the game with 65 rushing yards, and added 19 yards on 2 pass receptions. I haven't been around many games where the players hit harder. Sometimes people watch a game and see turnovers and they talk about how sloppy the play was. The mistakes in that game weren't invented, at least not by the people who made them. Most were forced. "We figured we could win if our offense didn't put us into too many holes", said 35-year old Colts lineman Billy Ray Smith, who was playing in his last NFL game, "Let me put it this way, they didn't put us into any holes we couldn't get out of". Don McCafferty became the first rookie head coach to win a Super Bowl. ^ Eric Neel (January 22, 2003). "The Super Bowl barely makes the grade". ESPN Page 2. ESPN.com. Retrieved December 31, 2007. ^ William N. Wallace (January 14, 1971). "All of a Sudden, Miami Is Excited About Super Bowl, as Indicated by TV Blackout Fight". ^ With limited replay in the day, there was some controversy over whether Renfro actually tipped the ball after it bounced off Hinton's hands and into the arms of tight end John Mackey. (At the time, the rules stated that a pass could not be complete if it was touched by two offensive players in succession, without a defender touching the ball in-between) But Howard Cosell debuted an angle of the play on ABC's Wide World of Sports one week later which clearly showed the rotation of the ball had been changed when it passed by Renfro's hand, indicating he had indeed touched. ^ Jim O'Brien says there is a wide-spread notion that he was so nervous before his game-winning field goal, he forgot he was on artificial turf and attempted to pick up grass to test for wind. He says he was actually picking up lint from the players' jerseys. ^ Neft, David S., Cohen, Richard M., and Korch, Rick. The Complete History of Professional Football from 1892 to the Present. 2006 NFL Record and Fact Book. Time Inc. Home Entertainment. Total Football II: The Official Encyclopedia of the National Football League. The Official NFL Encyclopedia Pro Football. NAL Books. The Sporting News Complete Super Bowl Book 1995.